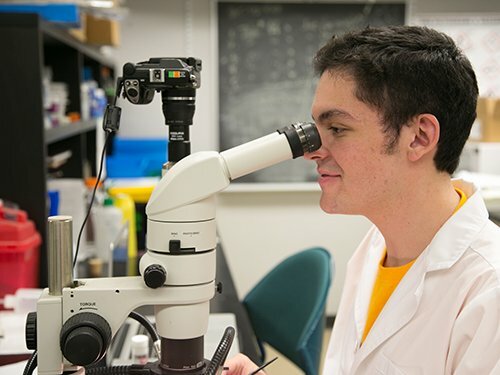 Co-valedictorian Jared Berman is a biology major who has conducted research in genetics and developmental biology since freshman year. (THOUSAND OAKS, Calif. – May 12, 2015) California Lutheran University honored several top students for their academic achievements at the 44th Annual Honors Day Banquet this month. Jared Berman of Westlake Village and Lauren Witman of Simi Valley both received the Provost’s Award for Academic Excellence as valedictorians of the Class of 2015. They had the highest cumulative GPAs for all college work. Berman is a biology major who has conducted research in genetics and developmental biology since freshman year. He is a member of the Tri Beta honor society and University Honors Program and has served as vice president of both the Scandinavian Student Club and the leadership honor society Omicron Delta Kappa. Witman is majoring in psychology and minoring in theology and Christian leadership. She is also a member of the University Honors Program and Omicron Delta Kappa as well as the Psi Chi honor society and has been active in campus ministry and community service. Twenty-two new members of the Scholastic Honor Society were named. Upper division students qualify for the university’s highest academic honor by maintaining a grade point average of at least 3.9 on a 4.0 scale. No more than 5 percent of the students from each graduating class are invited to participate. The members are Michael Alvarez, a business administration major from Newhall; BJ (Jack) Bension, a physics major from Agoura Hills; Salvador Brito, a biochemistry major from Oxnard; Brooke Delao, a chemistry major from Simi Valley; Justin Fallon, an exercise science major from Burbank; Ryan Fleming, a political science major from Moorpark; Julie Griffin, an English major from Fremont; Rebecca Haas, an exercise science major from Moorpark; Brian Hix, a music major from Sisters, Oregon; Kevlyn Holmes, a psychology major from Gazelle; Adrienne Ingalla, an exercise science major from Glendale; Michael Maimone, a business administration major from Woodland Hills; Jadie Mathews, a liberal studies major from Moorpark; George Nasr, a computer science major from Newbury Park; Sarah Peterson, an English major from Pleasanton; Kelsey Pettijohn, a business administration major from Malibu; Jennifer Robinson, a history major from Simi Valley; Troy Spencer, an accounting major from Fillmore; Austin Swank, a biology major from Paso Robles; James Sweeden, a business administration major from Omaha, Nebraska; Courtney Vendetti, a psychology major from Northridge; and Taylor Will, an exercise science major from Santa Maria. Kellie Warren, a Thousand Oaks English major, received the $1,000 Mark Van Doren Poetry Prize for a collection of poems. English Department faculty awarded Peterson the $500 Ledbetter Prize for Excellence in Writing for a literary essay that was deemed the best literary work by an English major. Matthew Ruffino of Moorpark received the $500 O. Fritiof Ander History Award as the most outstanding senior history major, and biochemistry major Trevor Hougen of San Diego received the $500 Smith Family Writing History Award for the best history paper submitted during the year.